Who finished first? I know you’re on the edge of your seat, short of breath, dying to know … it was me! For my 7 models I painted up my posse for Dracula’s America. Dracula’s America is an Osprey skirmish game set in the Weird West, yep it’s got cowboys and vampires and all sorts of radness. My chosen posse is the Forsaken, they are members of Custer’s 7th Cavalry who survived the Battle of Little Big Horn, but have come back with a curse. Lycanthropy! These are the official miniatures North Star Miniatures sells for Dracula’s America, but they are really licensed from Artizan Miniatures. While the miniatures are pretty simple as far as details go, the sculpts really impressed me and I enjoyed painting them quite a lot. As an extra two I painted up the two werewolves while I was at it. I can’t count them as my surprise two because they go with the 7 painted. So what were my surprise inclusions? How about some mutated goblins for my underworld Blood Bowl team. Remember them? Jeff also finished the challenge. His first completed mini was for a special event in the Age of Sigmar campaign he’s participating in. The event featured a jousting game, so you know he couldn’t resist whipping up something for his Stormcast wannabes Flesh Eater Courts army. Not satisfied with one big guy, Jeff also painted up a big guy for his ork Blood Bowl team. Again another conversion, this time on the controversial troll from Games Workshop. I think Jeff did a great job modifying the questionable pose of the GW model. And for his seven, Jeff got back to the grindstone and ground out seven more genestealers for Space Hulk. There are two more lurking in the background (aren’t there always? Those blip counters can be nasty … ) but Jeff had completed those previously. And what about Jason? Well unfortunately life got the best of Jason and he couldn’t meet the deadline, coughing up the first $5 into the pot for failing to make the deadline. Minimum Requirement: 1 Halloween themed model … could be any kind of creepy crawl ghostly ghastly creature … or the thing(s) that bump back ie witchhunter, zombie survivor, ghostbuster, etc. Winner: Whoever paints the most models. This sets the bar low to avoid paying the $5 fee, but to win it’s paint as much as you can. There’s room to paint stuff that doesn’t fit for the theme, but themed models will count more. It’s hobby update time! I just realized I hadn’t shared anything about what I’m working on for our June Turn It Up to 11 miniatures painting challenge. Eleven miniatures that need to be painted … that coincidentally aligns with the starting roster for a Blood Bowl team. And it just so happens I’m starting up a new team for our league’s summer season. Some guys in the league were talking about playing goblins and vampires, so I decided to step off the beaten path and go for something a little different for me. Underworld denizens! Well, you might have noticed that things have been a little slow on the site lately. There are a few reasons for that such as the fact that there haven’t really been any new releases for Blood Bowl, or any new information about the upcoming Necromunda release(until the last day or so, more to come on that). Another big reason is that I recently had surgery and that has really put me on the side lines for the last couple of weeks. 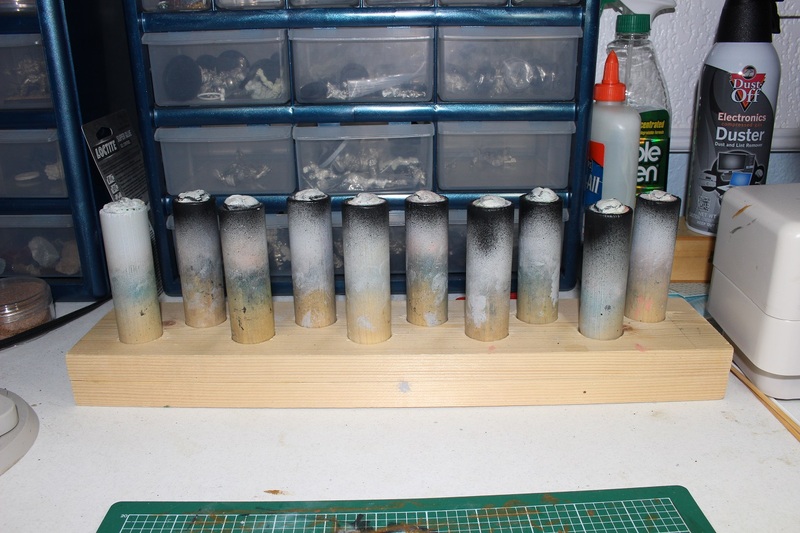 With all of that in mind, I have decided to write about something that makes an appearance in almost every post I write, though I have never really talked about it directly before… my miniature painting stand. Over the last couple of years, I have received a number of questions and comments about the stand, so I thought it was finally time to write a little about it.